On many cars it is very simple to rotate tires. You just remove them and move them to the appropriate spot (front to back, back to front), then re-install them. In the last few years however this have become a much more difficult job. Most cars these days have what is called a "Tire Pressure Monitoring System" or TPMS. There are also a lot of "all wheel drive" cars on the road. These two things make rotating your cars tires more difficult. It can still be done, but you need much more info and, in some cases, specialized equipment in order to do this job. What is TMPS and How Does it Work? The primary reason that it is becoming harder to rotate tires is because of what is called TPMS or Tire Pressure Monitoring System. This system does just what its name suggests. It monitors the pressure in your tires to be sure that they are properly inflated giving you increased tire life and better gas mileage. It can also alert you if you are about to lose tire pressure while driving. What's the big deal you ask? Well the "problem" with these systems is that each tire must have a sensor inside of it that can tell the computer how much pressure is in it. This would not normally pose a problem, but each of these sensors are "marked" by the computer so the cars computer knows which tire is which. 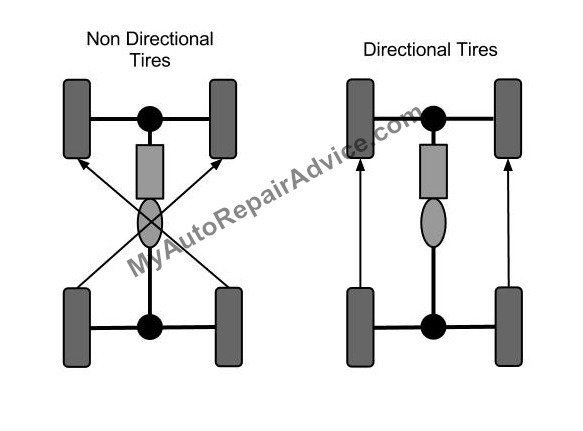 This means that the computer knows the difference between the right front tire and the right rear tire. When "Joe Carowner" goes to rotate their tires the computer can no longer tell which tire is which and it will turn on a light on in the instrument panel. This light will not go out until it is reset. Most TPMS sensors have to be reset using a scan tool whenever the tires are rotated and some of them even have to be reset even when you are just putting air in the tire. Starting in 2008 the government requires that car manufacturers use this system on their cars. This means that your car has this system if it was made after 2008. Many cars that were made before this date have this system so be sure to check your owners manual before you try to do anything related to your tires. You can buy a scan tool that will re set this system at most any auto parts store or you can take your vehicle to your local mechanic to have it done. Some auto part stores can reset them as well. Should You Rotate Tires Yourself? If you have a scan tool that can reset TPMS codes or if your vehicle is not equipped with this system then you can do this job fairly easily. You will need to have a good jack and jack stands and a basic set of hand tools, including a torque wrench. Then you simply put the tire that is on the front right on the back left and the tire that is on the back left goes on the front right. Then the same for the other side. I would say that if you have an older vehicle (2000 and older) then yes, you should be able to do this job fairly easily. If you have a newer car that does not have a TPMS system, also yes, but if it does have this system, then I would leave it to a professional. If you really want to do this job yourself then I recommend taking your car to a shop that has a TPMS scan tool so they can reset the sensors. You can also buy a TPMS reset tool for your car that would work as well. Some of these tools have a learning curve so be sure that you have read the instructions and feel comfortable before you try it yourself.